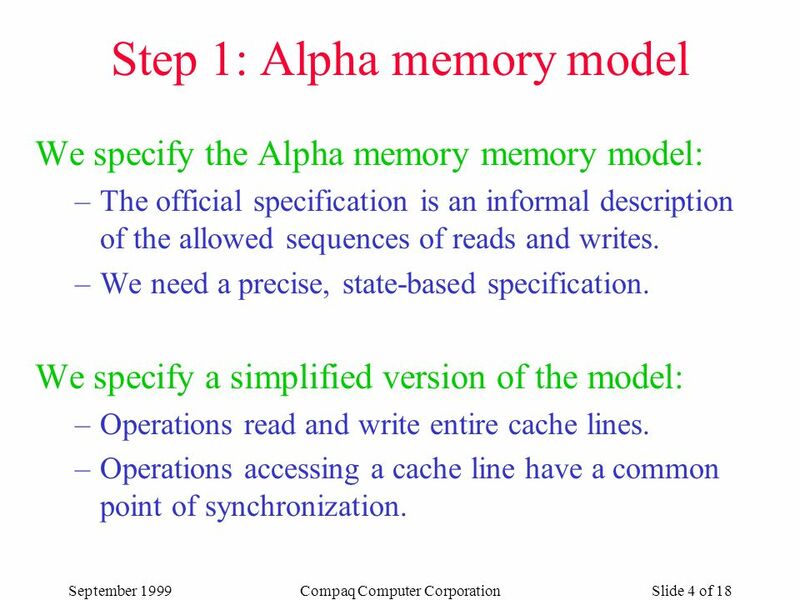 4 September 1999Compaq Computer CorporationSlide 4 of 18 Step 1: Alpha memory model We specify the Alpha memory memory model: –The official specification is an informal description of the allowed sequences of reads and writes. 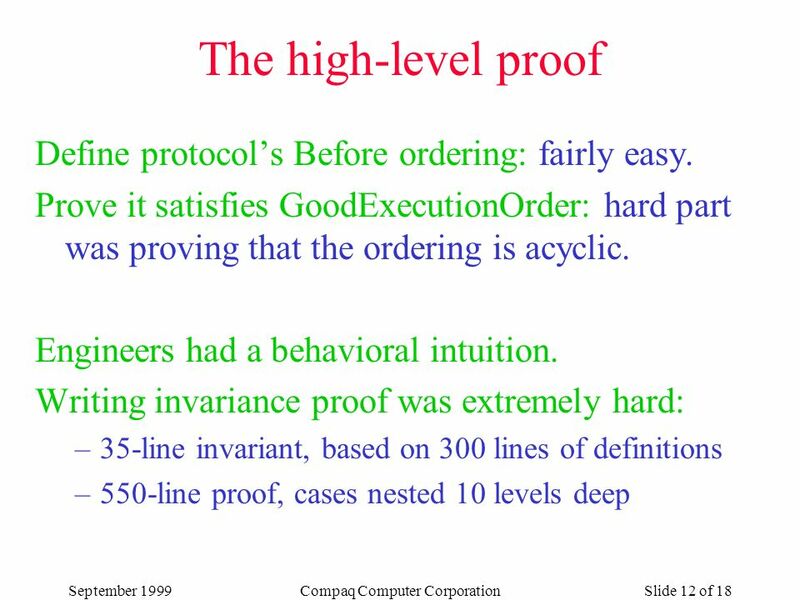 –We need a precise, state-based specification. 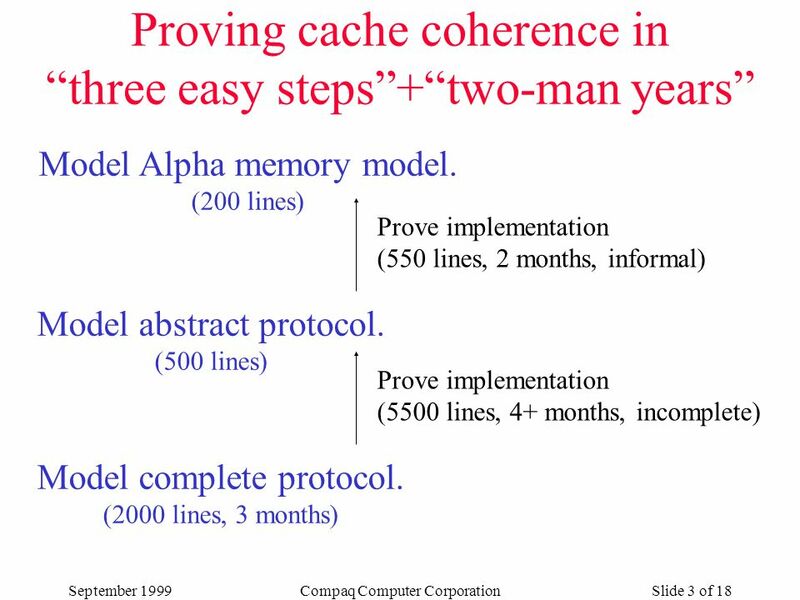 We specify a simplified version of the model: –Operations read and write entire cache lines. 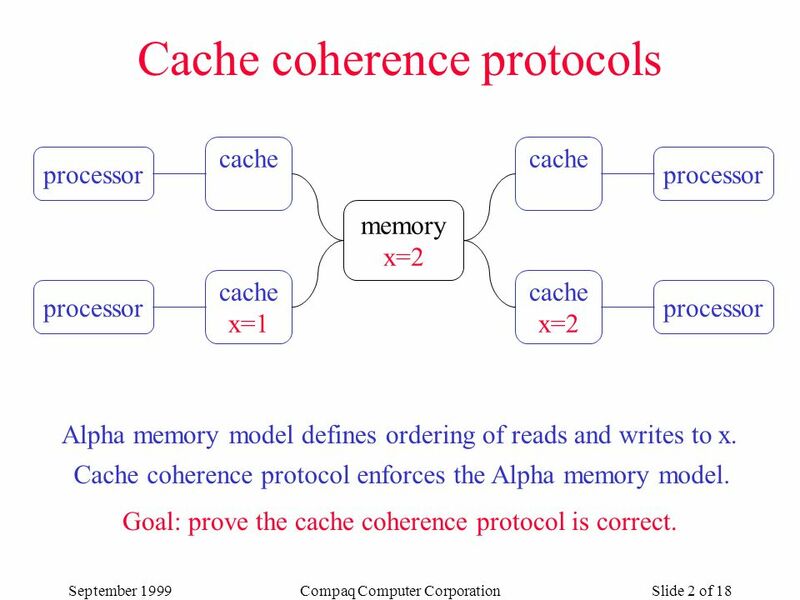 –Operations accessing a cache line have a common point of synchronization. 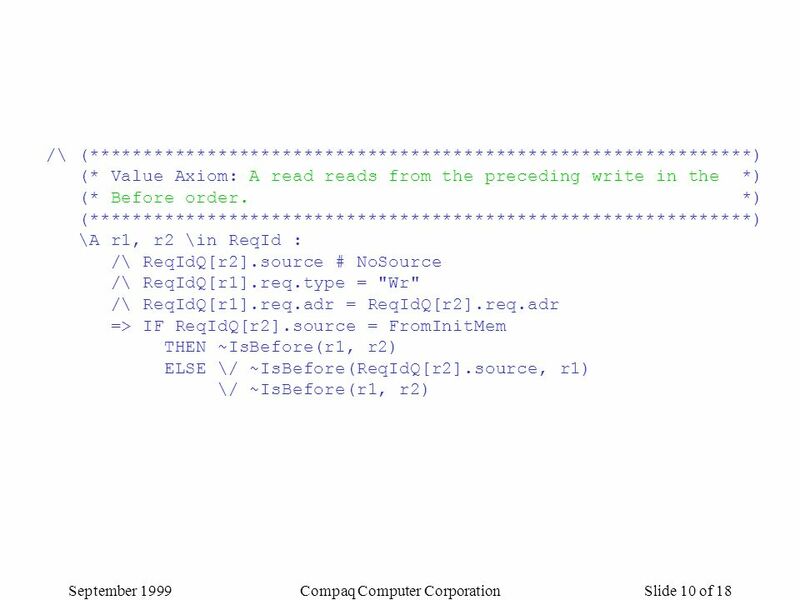 5 September 1999Compaq Computer CorporationSlide 5 of 18 Key definition: read/write ordering Before order for an execution orders reads/writes and determines what values are returned by reads. 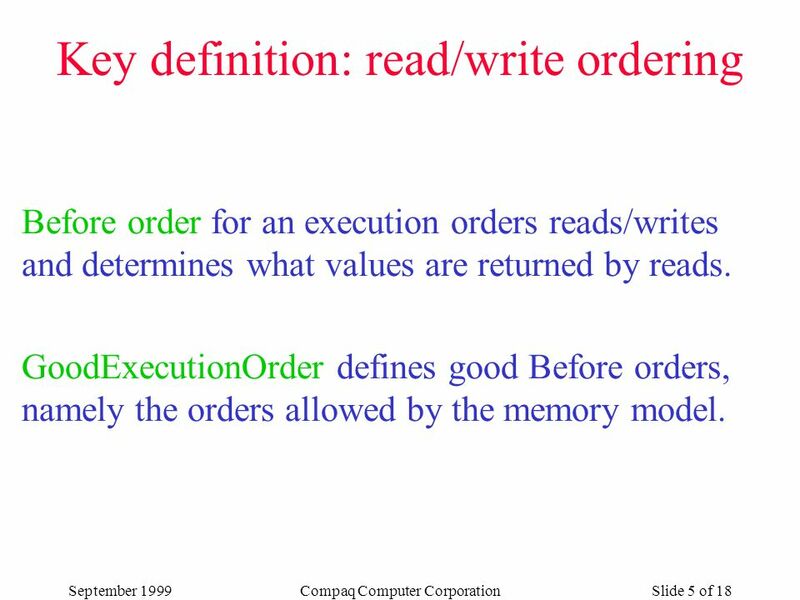 GoodExecutionOrder defines good Before orders, namely the orders allowed by the memory model. 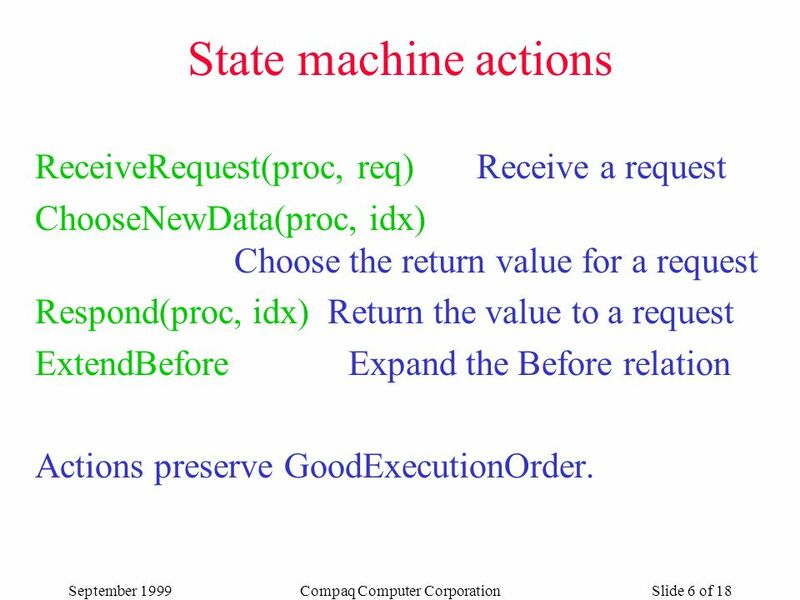 6 September 1999Compaq Computer CorporationSlide 6 of 18 State machine actions ReceiveRequest(proc, req) Receive a request ChooseNewData(proc, idx) Choose the return value for a request Respond(proc, idx) Return the value to a request ExtendBefore Expand the Before relation Actions preserve GoodExecutionOrder. 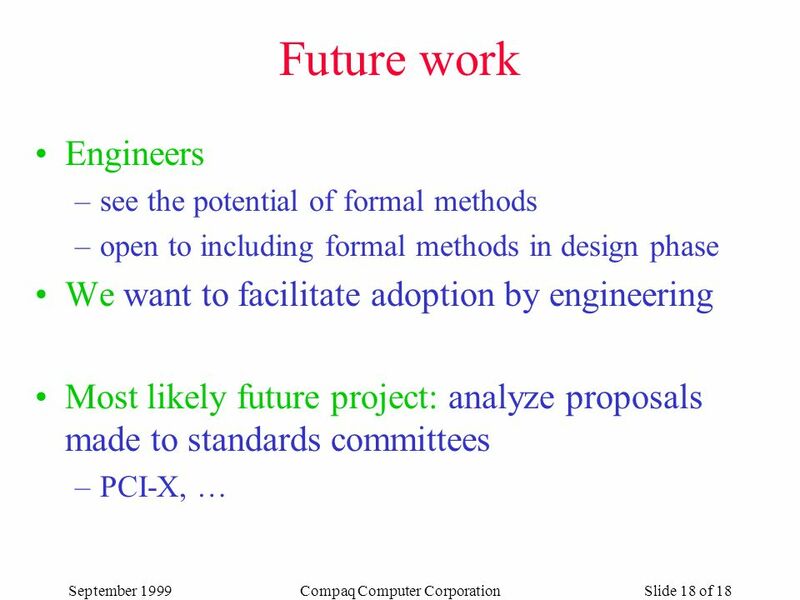 7 September 1999Compaq Computer CorporationSlide 7 of 18 GoodExecutionOrder GoodExecutionOrder == LET [some definitions deleted] IN /\ (*************************************************************) (* Before is a partial order. 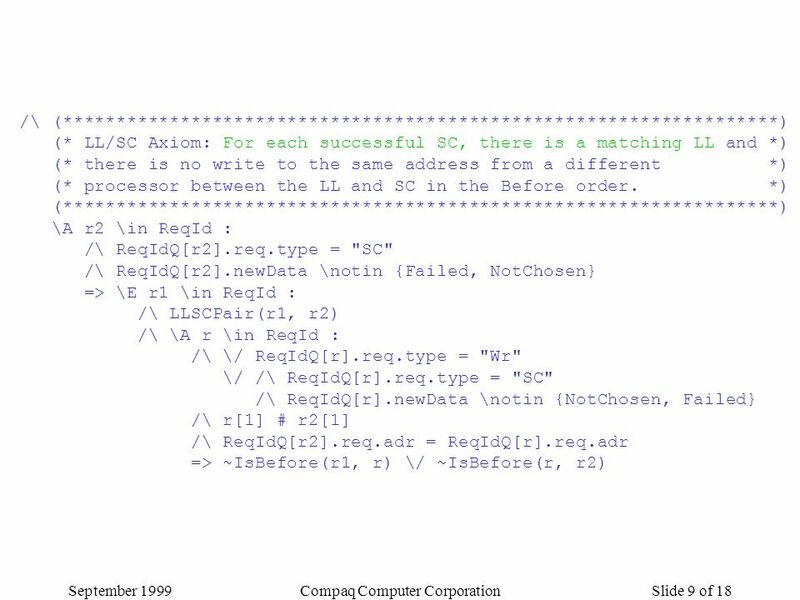 *) (*************************************************************) /\ Before \subseteq ReqId \X ReqId /\ \A r1, r2 \in ReqId : IsBefore(r1, r2) => ~IsBefore(r2, r1) /\ \A r1, r2, r3 \in ReqId : IsBefore(r1, r2) /\ IsBefore(r2, r3) => IsBefore(r1, r3) /\ (*************************************************************) (* SourceOrder implies the Before order. 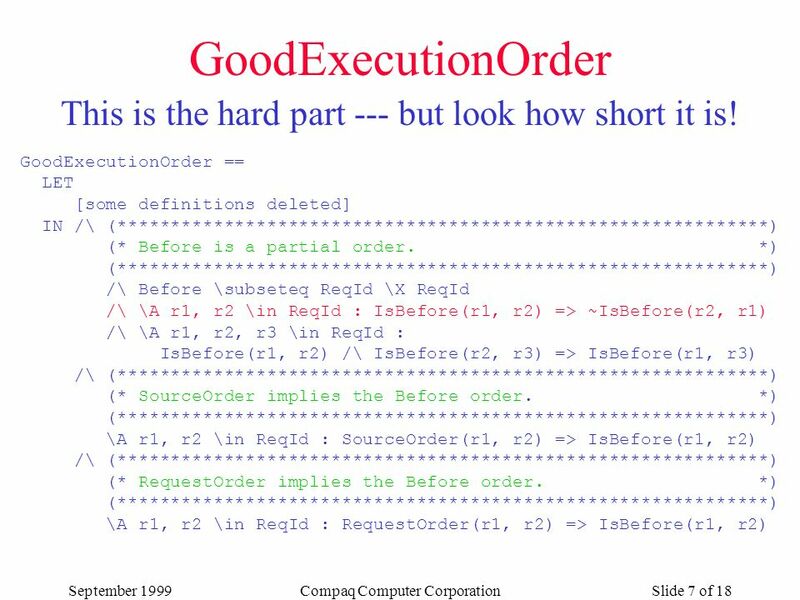 *) (*************************************************************) \A r1, r2 \in ReqId : SourceOrder(r1, r2) => IsBefore(r1, r2) /\ (*************************************************************) (* RequestOrder implies the Before order. 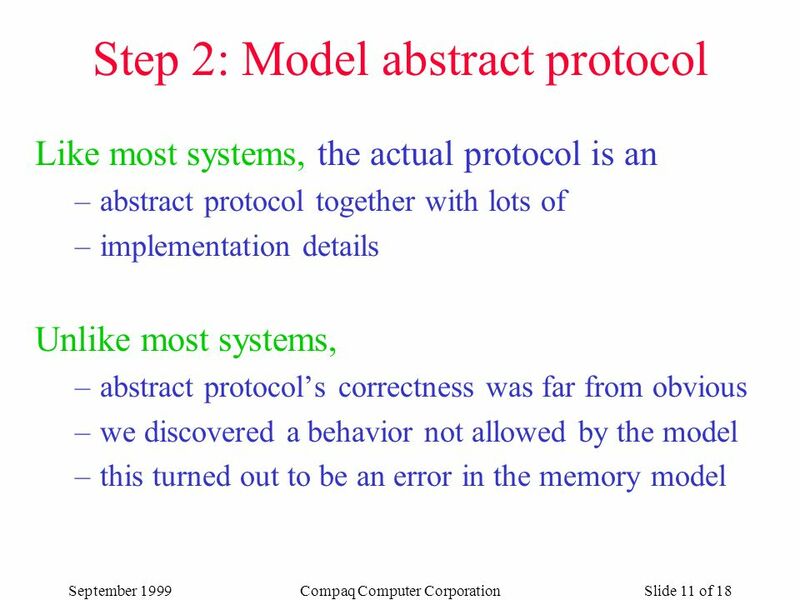 *) (*************************************************************) \A r1, r2 \in ReqId : RequestOrder(r1, r2) => IsBefore(r1, r2) This is the hard part --- but look how short it is! 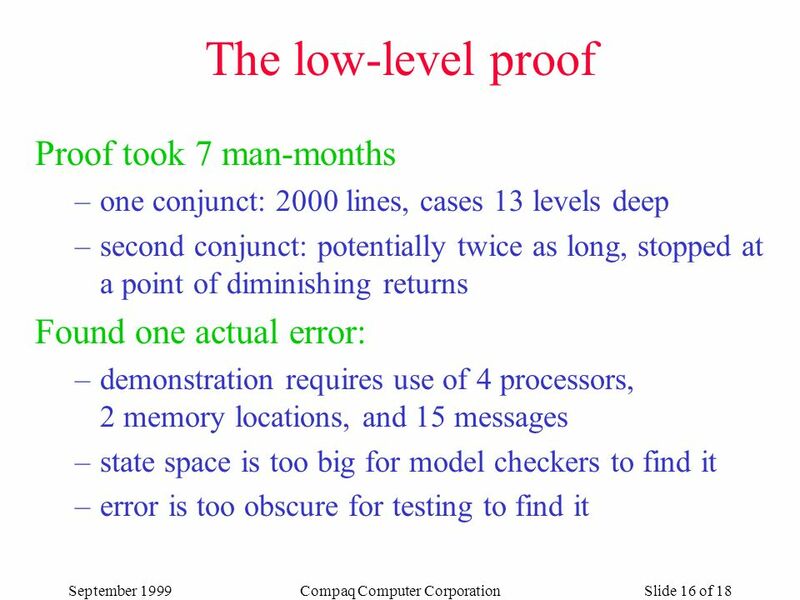 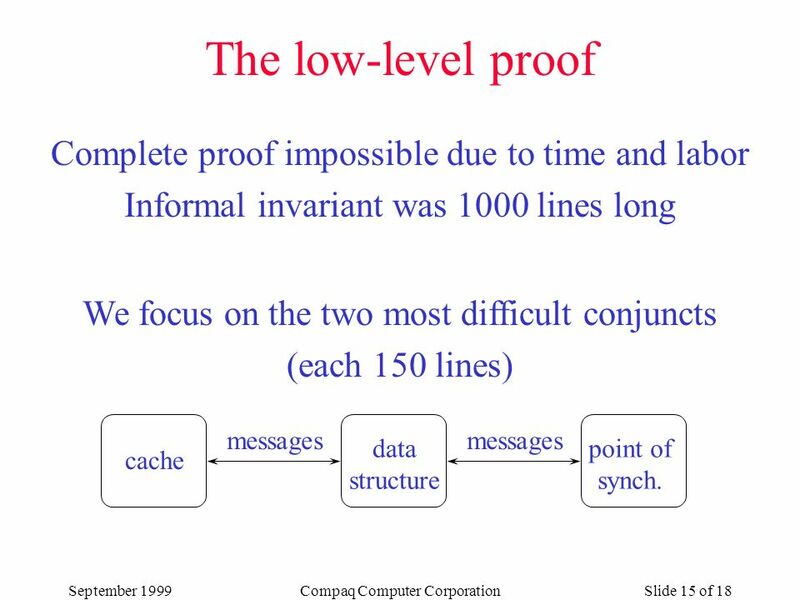 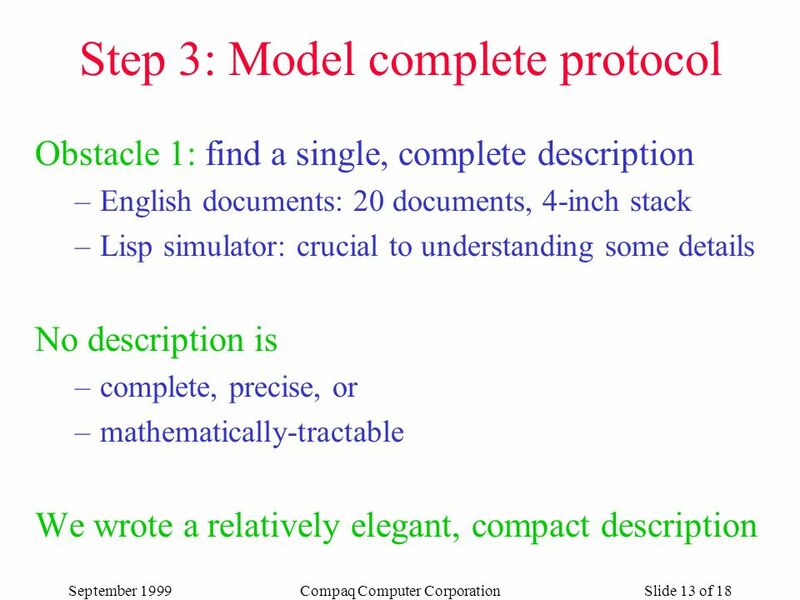 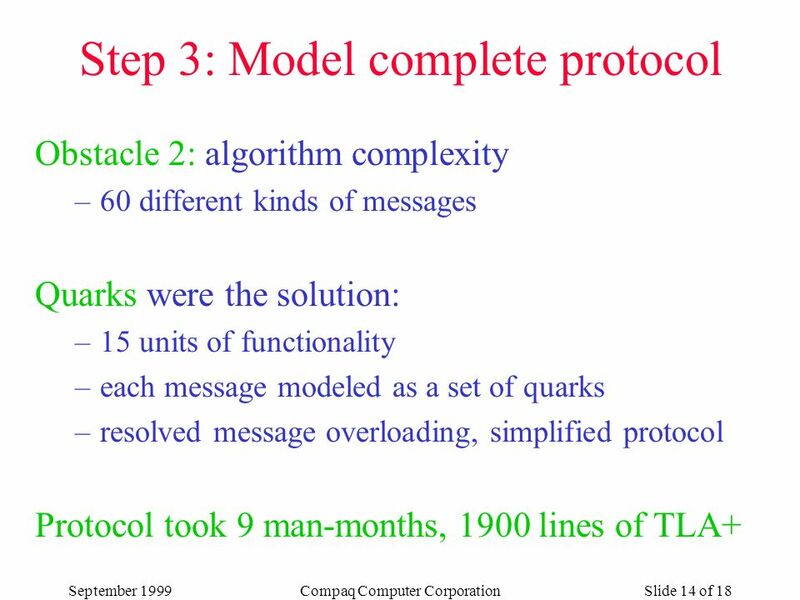 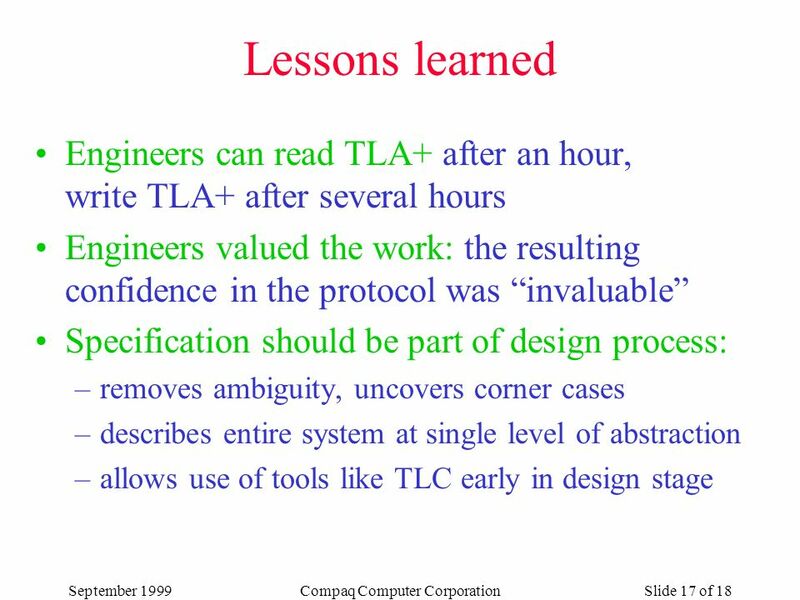 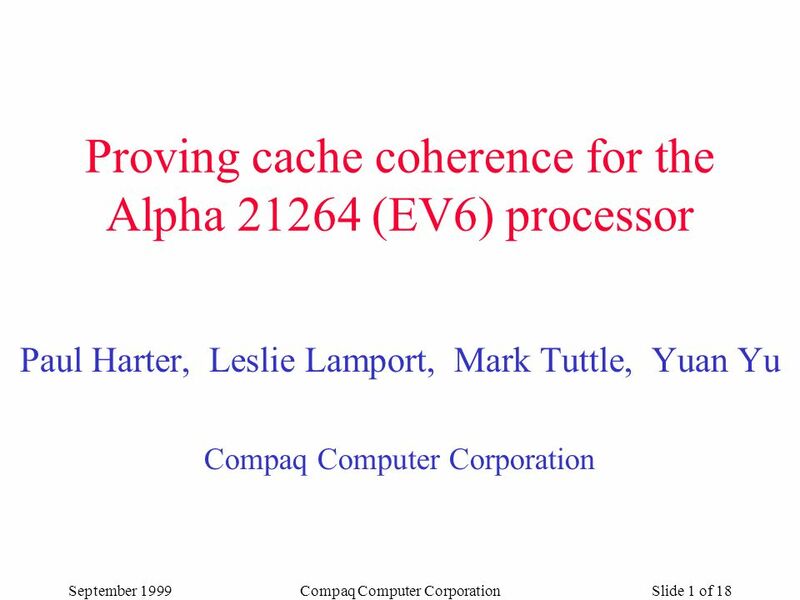 Download ppt "September 1999Compaq Computer CorporationSlide 1 of 18 Proving cache coherence for the Alpha 21264 (EV6) processor Paul Harter, Leslie Lamport, Mark Tuttle,"